The title might be borrowed from Shakespeare, but the aesthetic is pure Miyazaki. 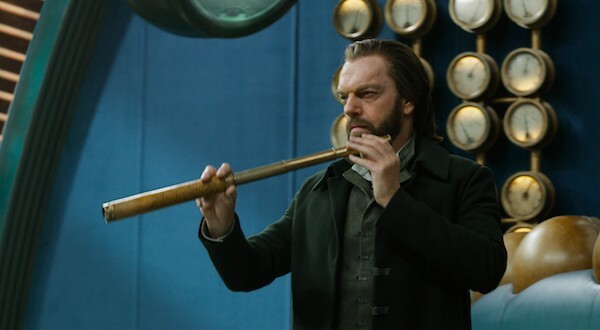 Based on the first in a series of Young Adult novels by Philip Reeve, Mortal Engines (**1/2 out of four) is yet another film set in a post-apocalyptic future wherein food and water are scarce, the strong prey on the weak, and Mennen Speed Sticks and other hygienic niceties have doubtless long ceased to exist. The largest cities have been placed on wheels and roam the wastelands, devouring smaller towns (i.e. integrating the citizenry into their own but stealing all of their resources). London is the largest of such burgs practicing what is known as “Municipal Darwinism,” and its chief architect is Thaddeus Valentine (Hugo Weaving), who of course is soon revealed to be a murderous opportunist. It’s up to the bitter Hester Shaw (Hera Hilmar) and the naïve Tom Natsworthy (Robert Sheehan) to bring him down, although they have plenty of allies — chief among them are a rebel leader known as Anna Fang (singer Jihae) and Valentine’s own daughter (Leila George). The plot is both daft and derivative (there’s even a Vader-friendly “No, I am your father” moment), and the commonplace YA elements end up overtaking the welcome WTF moments by the end. But because this comes from Peter Jackson (here in producing and scripting modes) and many other folks involved with The Lord of the Rings, the world-building is spectacular and almost makes this worth the price of admission. Steampunk is the driving style here, and this might be the first live-action movie to successfully mimic the design of Hayao Miyazaki’s animated epics. Howl’s Moving Castle and Castle in the Sky loom large, and while there’s no catbus co-opted from My Neighbor Totoro, there is a camouflaged vehicle that scurries along like a metallic caterpillar. To quote from another Shakespearean work, “If this were played upon a stage now, I could condemn it as an improbable fiction.” But since it’s a movie being played upon a screen, I merely take such nonsense in stride.